The Daily Word challenge is a source of inspiration for scrapbook layouts, photos, or journaling. Use them however you feel inspired! The challenge is in our Facebook Group. If you aren’t a member of our group already we’d love to have you join us. It’s our community for digital scrappers to gather. You can ask questions, encourage others, share scrapbook layouts, participate in challenges and interact with other ladies. There is a Daily Word Prompt for every day of the month, however, you can use the ones you want and in any order. Have you lost your mojo? 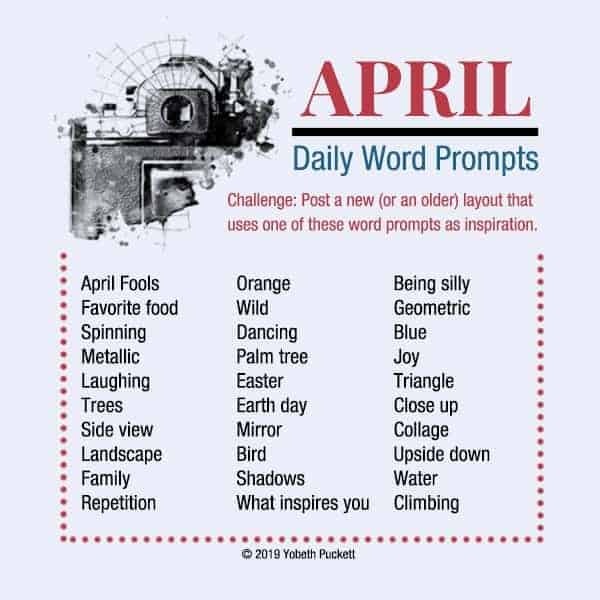 Use a prompt a day for a photo challenge or to create a scrapbook page. They can even be used when you’re stumped for a story to tell. In other words, use them in any way you feel inspired. If you share the Daily Word Prompts be sure to give credit and link back to this post.